For the 150th edition of Date Night, we travel to a place in Roswell where rebar rules the roost. And the food happens to be pretty good too. 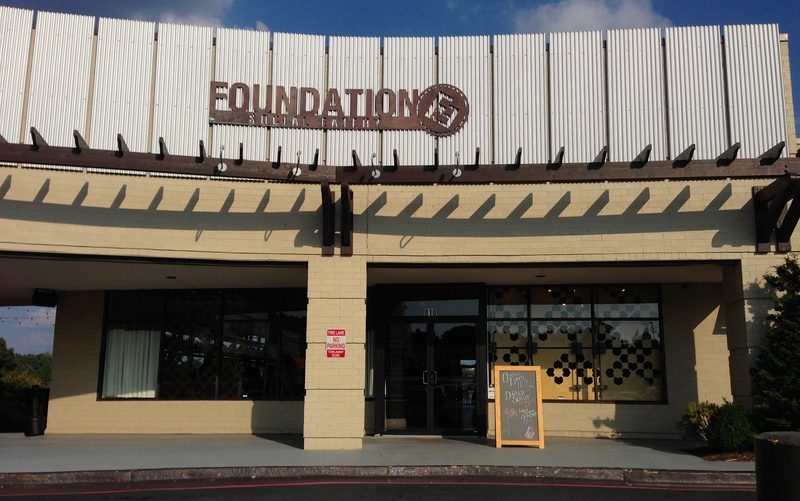 We are at the Foundation Social Eatery, which is located in a quiet shopping center just east of GA 400, away from the crowds and sparse parking of downtown Roswell. 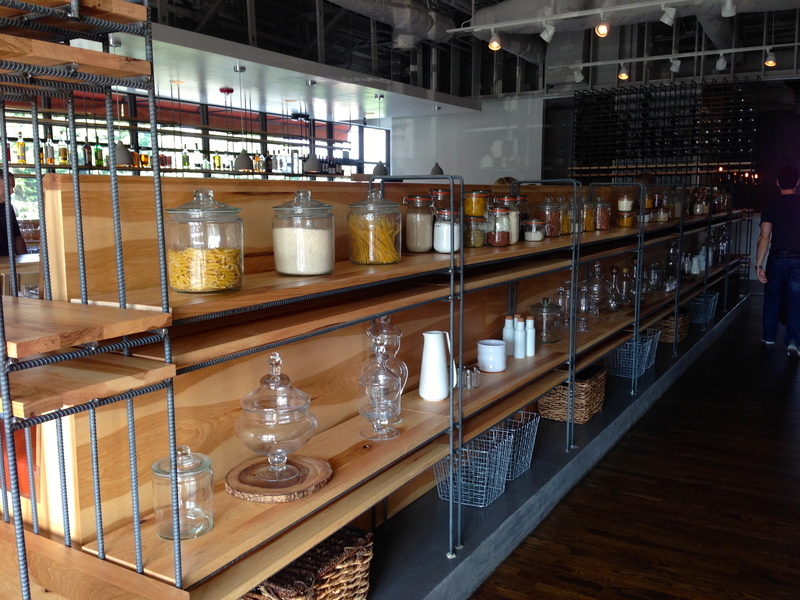 Walking into Foundation, we see something that’s quite unique in restaurant decor: rebar. Rebar is the steel they put into concrete to give it strength. 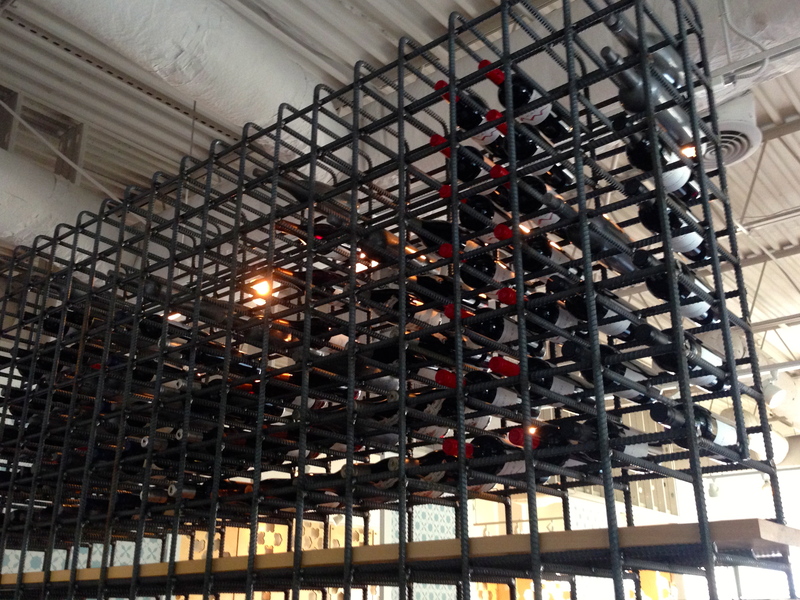 It’s worth a visit here just to see how it’s used throughout the space, like with this wine rack. Who thinks of this stuff? Evidently, since rebar is used in foundations, the designers thought that it would be fun to use it at “The Foundation”. We think they did a great job. We wind up in a back room that’s sort of cut off from the action. It allows us to have a quiet date for a change. But this is a food blog, not Architectural Digest. Some investigative reporting finds that a lot of the staff here were “poached” from Century House in Woodstock (Date Night, 1/24/14), which bodes well for the food, the service, and the overall success of this establishment. Our meal begins with beer, even though that wine rack dominates the dining room. Speaking of Woodstock, on tap tonight is Reformation Prohibition a Belgian triple made in…Woodstock, GA. (As an aside, the Woodstock music festival happened 35 years ago this week.) It’s a new brewery for us, and this is a good selection. It tastes a lot like Victory Golden Monkey, another of our favorites. One of the brewers happens to work at Foundation and he comes over to visit to find out how we like it. It turns out that we like it a lot and would definitely order it again. 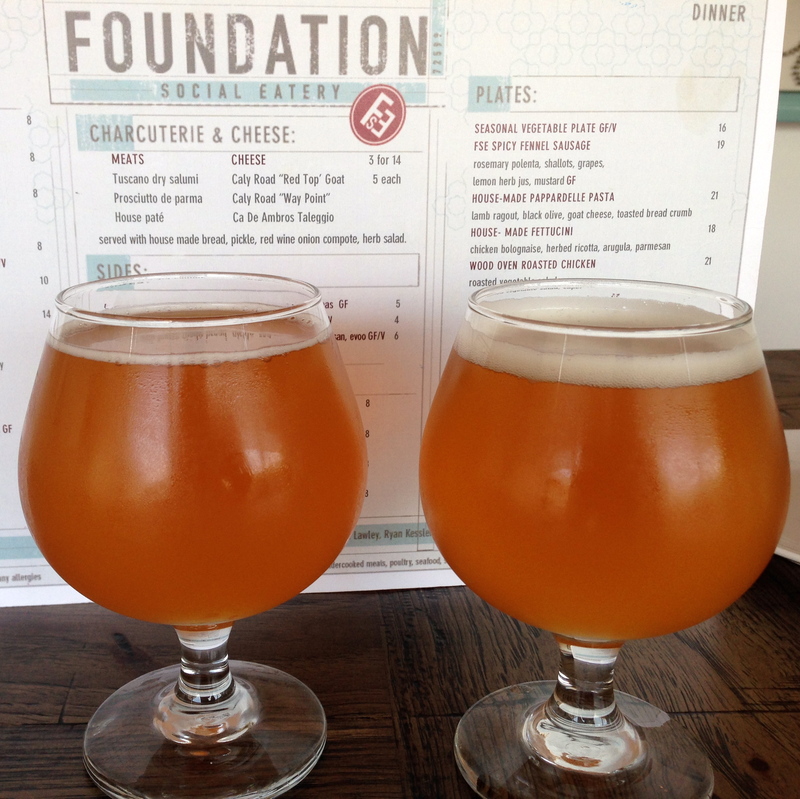 There are many choices in the “beginnings” department and we decide to order two of them. The focaccia comes with some very soft butter, olive oil and tapenade. The tapenade tastes like it has anchovies, which makes it salty and a bit fishy. This is a nice way to start, but I think we just spent $5 for bread and butter. Maybe they should bring this to you for free when you sit down, but hey, we fell for it. 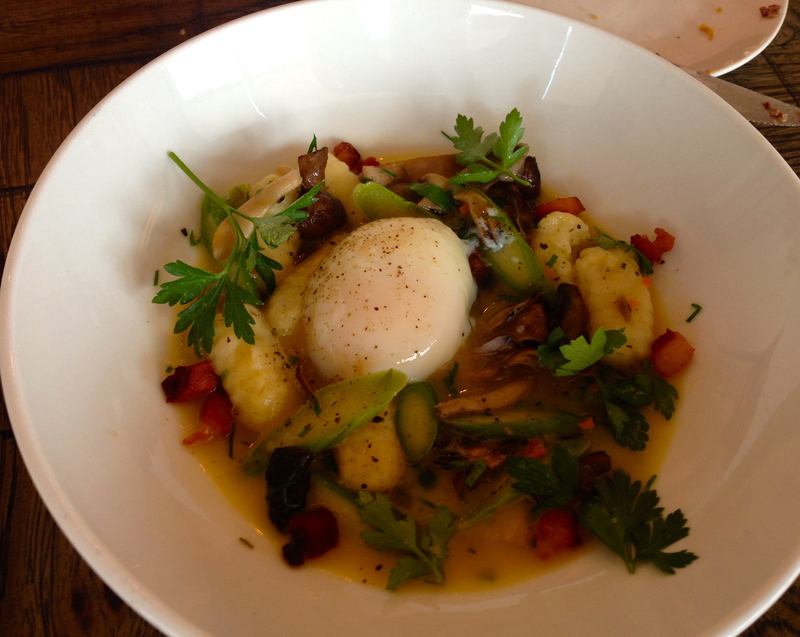 The potato gnocchi comes loaded with mushrooms, asparagus and bacon. The star of the dish is the soft-cooked egg, which we are told to break up and swirl into the dish. This makes a wonderful sauce that we want to lap up, but there is no bread (or spoon) served with the dish to ensure plate cleaning. We should have asked for bread, which we saw go by on several orders of mussels. But carbs and gluten are bad for you, right? Our main “plate” has neither. We split the local grouper, which they are nice enough to halve in the kitchen for us. The photo is only half an order, although I easily could have eaten a full order. The fish is nicely cooked. It’s crispy on the outside and moist on the inside. 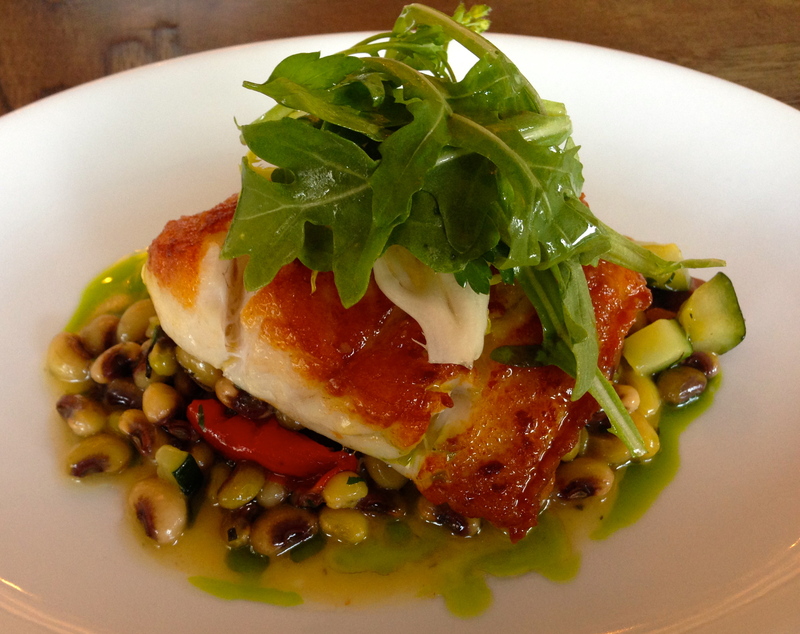 It sits atop a fresh mixture of field peas, olives and zucchini. We really enjoy this dish. 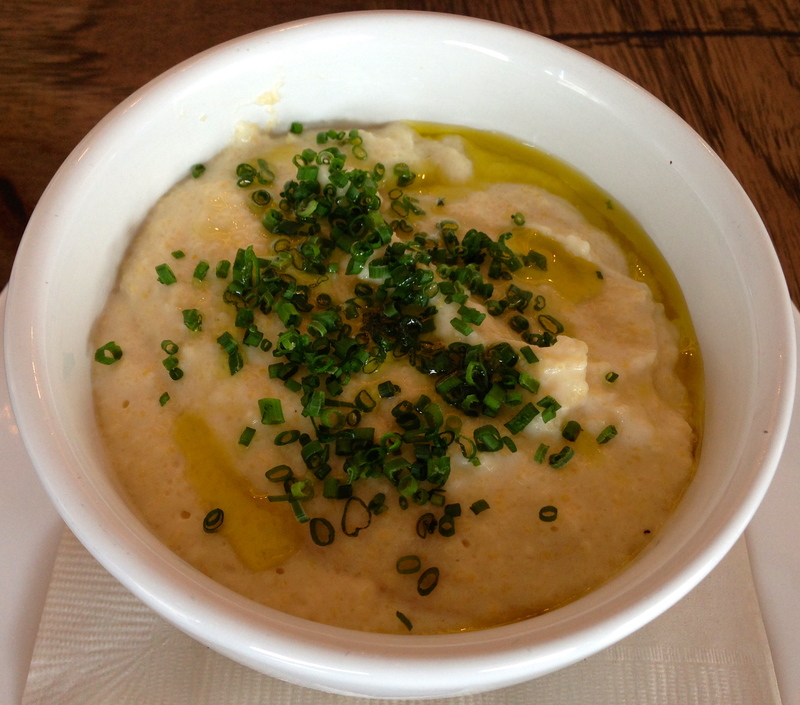 We also get a side of rosemary polenta. It’s very creamy, full of olive oil, and the rosemary tastes very fresh. Because we split the main course, we have a small amount of room left for a light dessert. The vanilla pots de creme is light and tasty. 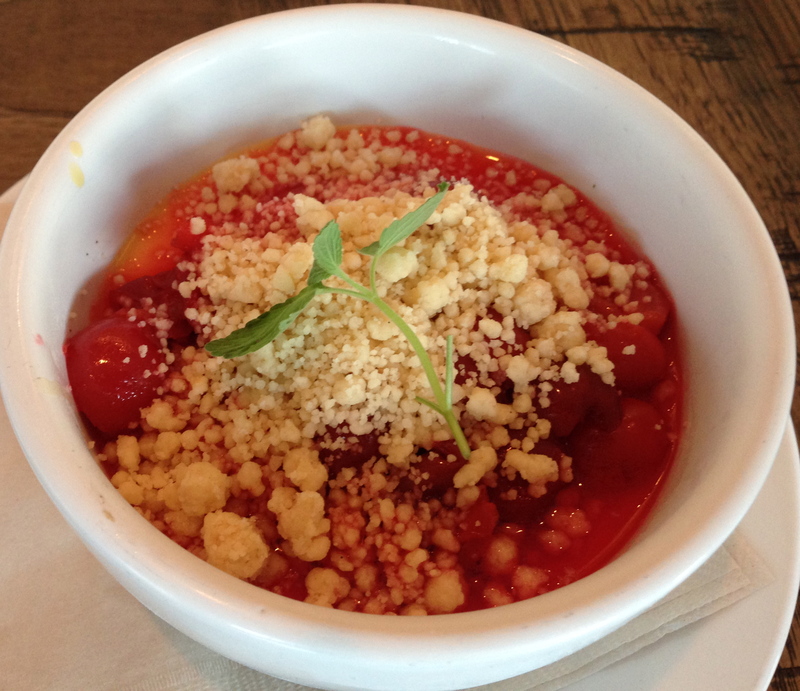 On top of the creme is cherries and crumbled shortbread. They had me at cherries. It’s the perfect way to end the 150th edition of Date Night. That soft cooked egg looks heavenly. Too bad you couldn’t “sop” it all up at the end of the dish. Adding this place to the list. Thanks for the review!